Click to viewIf you're the kind of user who enjoys either soft, laptop-like scissor keys or a curved ergonomic keyboard, you're already gonzo'd over Microsoft's earlier keyboard, the Wireless Entertainment Desktop 7000. But if you're looking for the top of the line—the real grandaddy of Microsoft keyboards—you're looking for the Wireless Entertainment Desktop 8000, otherwise known (by Microsoft) as the Ultimate Keyboard. So what makes this keyboard so "ultimate"? Well, if you take the already impressive featureset from the 7000—the wireless connectivity for mouse and keyboard, the impressive styling, the comfortable key placement, the extra media keys, and the rechargeable mouse—but add in a specialized magnetic dock and an even sexier aluminum finish, you're going to end up with one beautiful input device. It's fantastic. Best improvement on this keyboard is, without a doubt, the magnetic dock. 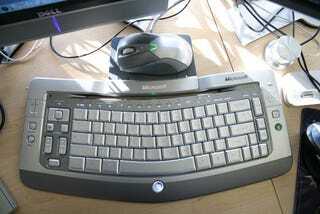 It's similar to the dock used in the 7000, but now has a magnetic clasp to hook into the keyboard. That means now both the keyboard and the mouse are rechargeable and wireless. Just dock the keyboard, oh, every few months or so, and you'll never run out of juice. Even the laziest of us can do this, and trust us, we're pretty lazy. The great thing about this dock is that it doesn't just charge the keyboard, it's also got a built-in 4-port powered hub! You can even plug in the included USB Bluetooth dongle in one of the ports (especially shaped to hold it) so you won't have to give up one of your regular ports on your PC. Brilliant. Microsoft's also swapped out the black, plasticy keys for a more silver/aluminum material which goes around the entire trim—which makes the keyboard more solid and less cheap. But underneath that finish lies a MacBook Pro-like backlight, which looks pretty spectacular when you're playing WoW at 3AM. The whole setup is controlled by a motion sensor in the wrist rest, which turns on the keyboard and backlight if you approach. The 7000 also has this sensor, but all that does is turn on the keyboard. According to the industrial designer, they took design details from Cadillac and BMW and certain cellphones to shape the keyboard and mouse. If you're going to be inspired, might as well be inspired by the best. The bad news is that many of the problems the 7000 had are still present in this version. Since it's essentially the same keyboard, that means the arrow keys are still too small, the touch-sensitive F1-F12 and escape keys are hard to press, the Windows key has been moved, and there's no num pad. The guys we talked to claimed that the Wireless Entertainment Desktop series of keyboards are supposed to be used as media keyboards and not as productivity keyboards, hence the focus on styling and the difficult-to-use function and arrow keys. But, since we've been using this keyboard daily for our own blogging activities, we can attest that it makes for a more-than-decent productivity keyboard—even if you do have to look down to hit the escape key. Would we recommend this keyboard? Only for people like bloggers, programmers or chat maniacs who are at their computer for 10+ hours a day. If you can deal with the difficult function keys, the lack of a num-pad, the small arrow keys, the weird Windows key placement and the gigantic price of $249, you'll definitely feel like you're typing on the ultimate keyboard. Otherwise, if you can do without the 4-port USB hub, the rechargeable keyboard, and the silver finish, head for the WED 7000 instead—which is available now instead of in May, like the 8000.